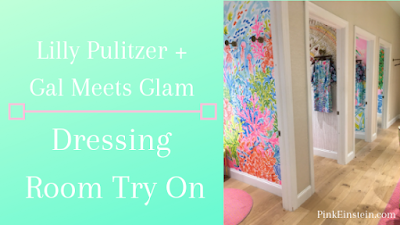 Life as Pink Einstein | Dallas Fashion and Lifestyle Blogger: Dressing Room Try On! McCray and I spent the day Saturday at North Park and had some fun shopping. We tried on a few different things from the Gal Meets Glam collection at Nordstrom and at Lilly Pulitzer. I loved most everything I tried on and had to share in case you wanted to shop the items too! Now that it's second semester of senior year McCray and I are in the market for a graduation dress and a grad party dress. We stopped in Lilly to see if they had anything and I wasn't very successful but McCray found a dress for our grad party and its adorable! She's kind of hiding behind me in these pictures but the dress she is wearing is the one she purchased and I love it. I wanted to try it on too but they sadly didn't have it in my size in the store. They didn't have a ton of shift dresses but I did try this one on. I wouldn't wear it to our grad party but it is definitely something I would wear to school. For reference I am wearing a small and could probably size down. Okay, I think this skirt is the cutest! It's a soft stretchy material and is long enough that I can wear it to school. McCray and I follow Julia on Instagram and we love her Gal Meets Glam collection. McCray has a few of her dresses but I didn't know what size I was in GMG so we went into Nordstrom to try on a couple of pieces. I love the idea of this jumpsuit and had so much fun dancing around the dressing room in it but the satin material makes it look a little awkward on when the light hits it and it didn't fit right. For reference, I am wearing a size two which I typically wear but this jumpsuit was so big and the one sleeve meant that it kept falling down. I loved this dress on the hanger but I don't think it's something I would actually purchase. The dress is the same color as my skin and makes me look very pale. A few things I do love about it are the length, the sleeves, and the fact that it has pockets. I thought this dress that McCray tried on was so cute! I love the blues and pinks and the adorable ruffle sleeve.